Salé et sucré | One quality, the finest. 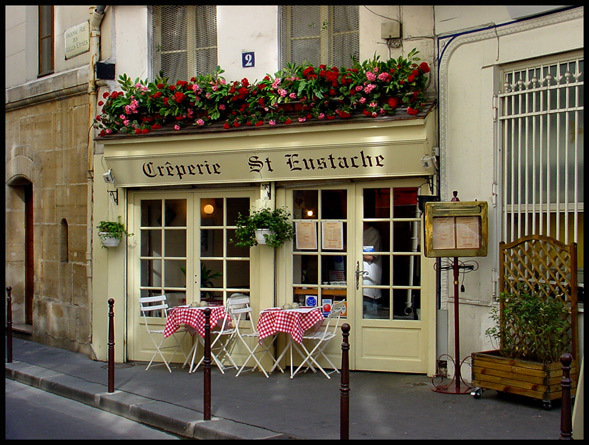 If you’re in the neighborhood of the Louvre and you’re looking for a simple, unpretentious place for a quick bite, check out Crêperie Saint Eustache (2 rue Sauval). I usually eat here at least once when I’m in Paris. The sunny yellow shop-front on angle is visible from rue Saint Honoré and at the end of Sauval, you’ll glimpse the Saint Eustache cathedral. It’s a tiny place, with about 20 seats. The menu is equally restrained, with classic crepe options, both savory and sweet. Don’t come here if you’re looking for experimental combinations, but you will find all the basics. Their menu of a savory and sweet crêpe plus a bolé of cider is a great value at under 10 Euros. Speaking of savory and sweet, when it comes to crêpes, you’ll see salé (salay) and sucré (soukray) on the menu. 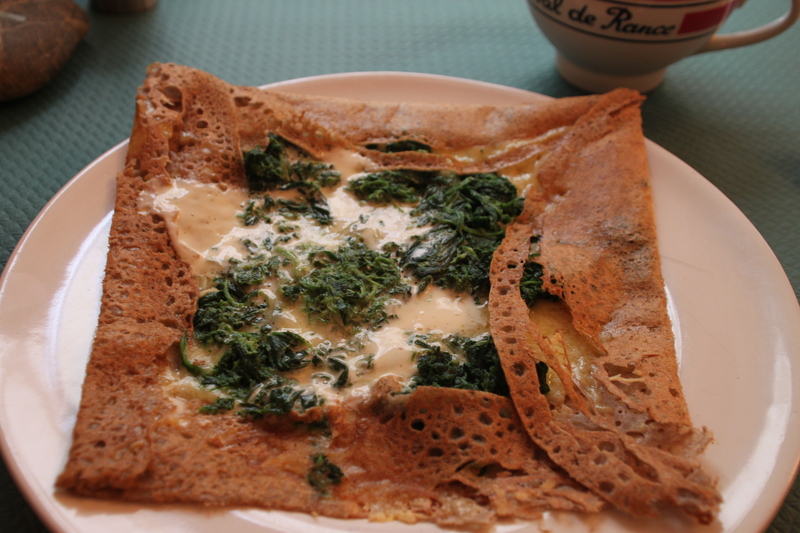 Savory crêpes made with buckwheat flour are known as galettes. The English word “savory” has many different translations depending upon the context. If the meaning is “appetizing”, like a savory stew, use savoureux or appétissant. If the meaning is that a person is somewhat disagreeable, or unsavory, try louche. If it’s a disagreeable place, use peu recommendable. Finally, if you mean the herb savory, that’s sarriette. The word salé can also mean salted. It all comes down to context. At Crêperie Saint Eustache, you’ll find crêpes that are salé and savoureux, but not trop salé, in an atmosphere that is recommendable served by someone who’s not at all louche. Some may even been seasoned with sarriette, but I don’t think it’s on the menu in any language. This entry was posted in Cuisine, Travel and tagged Crêpe, Crêperie Saint Eustache, Musée du Louvre, Paris, Rue Saint-Honoré, Salé et sucré. Bookmark the permalink. Pingback: Bon rapport qualité-prix | One quality, the finest. Sounds wonderful! Do you know whether they are open for dinner as well as lunch? We’ll be there over Christmas and would love to try it. I couldn’t swear to it. Small shops and restaurants tend to make up their own rules about staying open during the holidays. I’ve never been to Paris over Christmas, so I’m jealous of you! Thank you! We’ll stop by and see. We’re very much looking forward to being there!